Your institution must subscribe to JoVE's Chemistry collection to access this content. Protein crystallization, obtaining a solid lattice of biomolecules, elucidates protein structure and enables the study of protein function. Crystallization involves drying purified protein under a combination of many factors, including pH, temperature, ionic strength, and protein concentration. Once crystals are obtained, the protein structure can be elucidated by x-ray diffraction and computation of an electron density model. This video introduces protein crystallization and shows a general procedure. Protein expression and purification, crystallization, and x-ray diffraction are covered in the procedure. Applications of protein crystallization include in silico drug design, binding site determination, and membrane protein structure analysis. Protein crystallization is the process of obtaining a latticed solid form of a protein. These crystals are especially valuable to structural biologists, assisting in the study of protein function. Other techniques, such as mass spec or SDS-PAGE, can only provide information on the one-dimensional structure of proteins. Protein crystallization is complemented by the techniques of recombinant protein expression and x-ray diffraction. This video will show the principles of protein crystallization, a general laboratory procedure, and several of its applications in the biochemical field. The first step required in the process is to obtain milligram quantities of very pure protein, typically using recombinant protein expression. The gene corresponding to the protein of interest is cloned into an expression vector, and the expressed protein is fused to an affinity tag, such as poly-histidine, to assist in the purification by affinity chromatography. 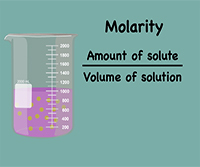 To learn more, see this collection's video on affinity chromatography. Formation of the purified protein into crystals is dependent on the proper combination of many factors, including pH, ionic strength, concentrations of precipitant and protein, temperature, and rate of equilibration. The most common method used is vapor diffusion, of which there are two categories: hanging drop and sitting drop. A droplet containing pure protein, buffer, and precipitant, which is an ionic solid that binds water molecules, reducing water availability for the protein and mimicking higher protein concentration, is in an enclosed microwell with a reservoir with a more highly concentrated mixture of the same buffer and precipitant. At the beginning, the concentrations of protein and precipitant are too low to cause crystallization. 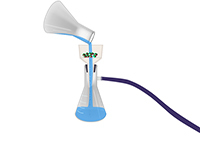 During the course of the experiment, water vaporizes from the droplet and collects in the reservoir; a decrease in the amount of water in the droplet causes the system to become supersaturated, and nucleation, followed by crystallization, can occur. The net transfer of water from the droplet is in equilibrium, and the system is maintained until the process is complete. To visualize the 3D structure, x-ray diffraction is used. To obtain x-ray data from a crystal, it is placed in a monochromatic x-ray beam, where it is exposed to the beam at all angles. Each exposure provides an image, where each spot is a diffracted x-ray, which emerges from the crystal and is registered by a detector. The data are combined to produce a model of the arrangement of atoms within the crystal. The resulting crystal structure demonstrates the 3-dimensional placement of the atoms, with a typical resolution of 2 angstroms. Now that we have covered the principles of protein crystallization, let us look at a generalized protocol. To begin the procedure an expression vector containing the gene of interest is transformed into cells. The cells are incubated and at mid-log phase, expression is initiated by adding an inducer, such as IPTG, which triggers transcription of the gene's mRNA. After protein expression, the crude material is suspended in lysis buffer, and then clarified by centrifugation. The clarified lysate is then loaded onto a nickel column, and the polyhistidine-tagged protein binds to the column while all other biomolecules are washed away. Once several milligrams of pure protein have been obtained, it is ready for crystallization by vapor diffusion. A 24-well hanging/sitting drop tray is filled with varying concentrations of sodium chloride and sodium acetate buffer solutions. 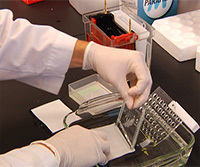 For the sitting drop method, equal volumes of protein and reservoir solution are pipetted onto the shelf above each well, and then the tray is covered with transparent tape. The tray is then placed in an incubation chamber, and the wells are monitored for growth the following day, then every few days. Once a proper crystal has been obtained it is ready for x-ray diffraction analysis. The crystal is mounted on a goniometer to position the crystal at selected orientations. The crystal is illuminated with a monochromatic beam of x-rays at all angles, producing a diffraction pattern. 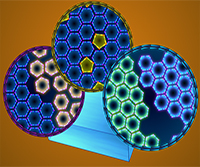 The software converts the two-dimensional images, taken at different orientations, to a three-dimensional model of the density of electrons within the crystal by determining the positions of the atoms in the crystal. Now that we have reviewed a procedure, let's review some useful applications of protein crystallization, and another crystallization technique. Protein crystallization may be used for in silico drug design. The three-dimensional structure of Influenza virus's polymerase basic protein 2, which has been linked to viral infection in mammals, was determined by crystallization and x-ray diffraction. Potential binding sites in the protein are visualized, and with the use of a docking program, a three-dimensional molecule was designed that would insert into a cleft in the protein. Co-crystallization of protein-DNA complexes is also a useful technique. DNA-binding proteins modulate a wide variety of biological functions such as transcription and DNA polymerization and DNA repair; and crystal structures of these complexes can provide insight into protein function, mechanism, and the nature of the specific interaction. The E. coli protein SeqA, a negative regulator of DNA replication, was co-crystallized with hemimethylated DNA. Integral membrane proteins such as G-protein coupled receptors, or GCPRs, are difficult to crystallize due to their limited amount of polar surface area available for forming crystal lattice contacts, which has led to the development of fusion-protein-assisted protein crystallization. Genes encoding β2 adrenergic receptor, a GCPR, and a lysozyme were inserted into an expression vector. The crystallization of the β2AR- lysozyme fusion protein was achieved due to the increased extracellular hydrophilic surface over the naturally hydrophobic β2AR, provided by the lysozyme, necessary for forming packing interactions in the crystal lattice. You've just watched JoVE's video on protein crystallization. This video described its principles, a generalized protocol, and some its uses in the biomedical field. Thanks for watching! JoVE Science Education Database. Biochemistry. Protein Crystallization. JoVE, Cambridge, MA, (2019).